So folks have been asking me if I am going to sell the connie with the addition of the wing to my stable. I think I've decide that the answer is unquestionably, no. I say that for a few reasons. First, the concours is a PERFECT bike for me. That said, it's kind of lacking on the technical stuff, no fuel injection, old school suspension, small brakes....but when I get out and ride her, I have not a care in the world. I also say 'no' because the value is in the toilet right now. I paid 5000ish for it in 2013 and have since modded it quite a bit. Now, I'm seeing 2006 models going for 2600-3000 bucks. Just not worth it to take the hit. For 3k, I'll keep it another 10 years and enjoy it. Last, and more related to the topic of this thread, I have "Customized" it over the last few years into a beast I know, and want. I've got the lights I want, I've got the luggage I want, everything is where it should be, FOR ME. And I love that about the concours. Over the spring I installed some cheap, but functional, lights underneath my givi case. I'm sure people are like whaaaat is that!?! But the intent is that they are load lights/setup lights for going camping. If I pull into a camp site after dark, I can back the connie in, adjust the aiming of the lights, put her in park, and set up camp and get a fire started, all fully lit. So I'm curious to see how many coggers out there just ride it stock, versus getting their hand in and making it their own. I bought my '94 new in 1994 and have been making it my own for 22 yrs. Finishing touch has been SiSF's Torque cams and Steve's carb spa. My C 10 is damn near perfect!! Much better than new!! Chuck has to be a 10 because he's got his all turbo'd up and such. I guess mine is about a 7? I put LEDs in the dash, and it'll have fully custom fluids by next week. Hmmm, I am assuming the scale is based on the bike still being recognizable as a C-10 - i.e. 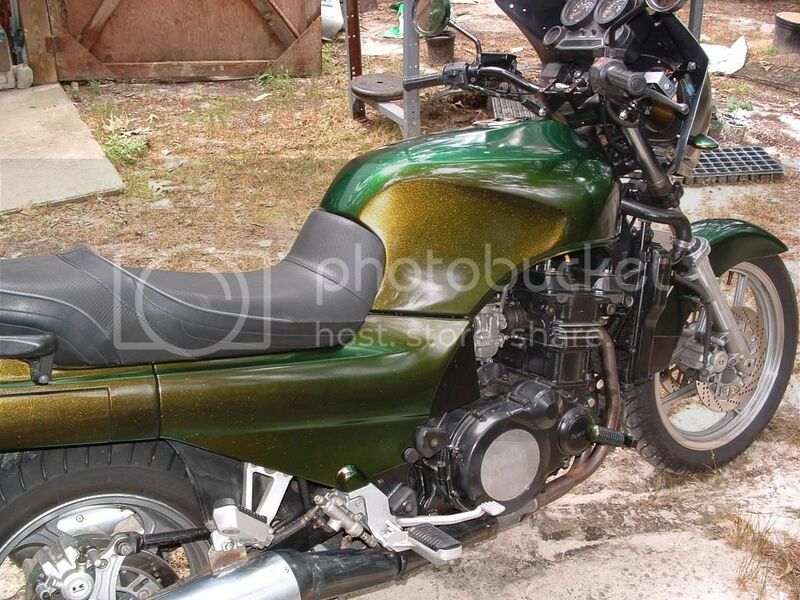 body work, etc, and not some naked café racer. Based on that, I would rate mine a 4.5? Oh, yeah, forgot the Spoofak, and block-off plates. Guess I am closer to a "5". I'd say 3; the only mods are the Cee Bailey windshield, blind spot mirrors, foam grips, LED tail/stop lamps with programmable flasher, and an extra LED brake lamp to replace the reflector on the rear fender. Also upgraded the rear brake pads to HH. Future mods include replacing all the reflectors with LED lamps, and driving lights on the forks, if I can configure a clean install. I'm going to go with an 8.5 on my 02 Silverbullet. I have pretty much modded anything that I didn't like and invented a few things that they don't make. And about a dozen handmade brackets to bolt all this stuff on. 75% stock I would guess. Most mods are rider comfort over mo power. 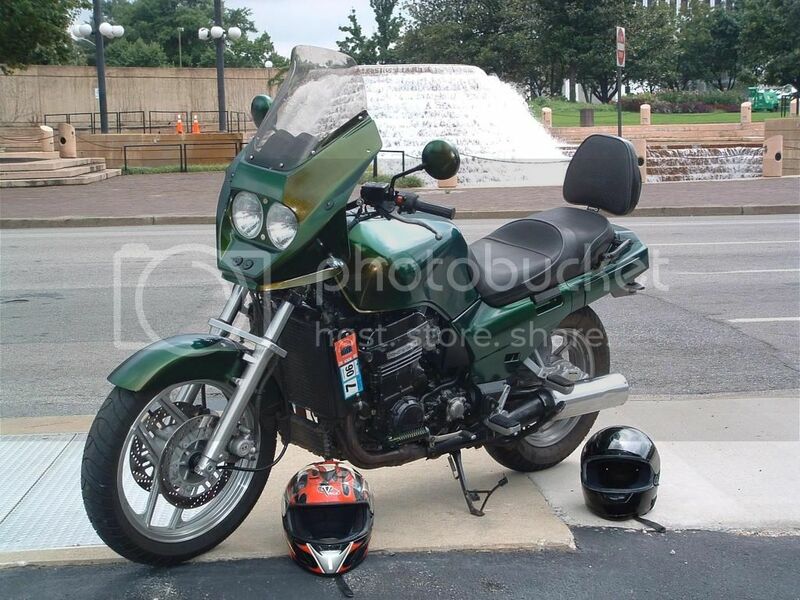 I bought a high mileage 1987 that I think is stock but old and I had dreams of making a mint - stock bike. When I was young and had to drive rusty old cars I admired those mint old restorations. Unfortunately the bike has taken a beating and I had trouble with old brake disks being too uneven to ride with confidence so I'm wandering away from the stock ambition. I'm going to say it's a 1 for aftermarket front disks, a tall boy seat, and now a Givi trunk. Soon it will have some Jeep silver painted parts. It has a COG name tag in the little window on the side. It also has dings, scratches, and reinforcements that aren't stock. = 50 52 mods. I might of missed a couple. I did, hence the modify to the post. Could be another or two that creap in to my highly functional retired brain. This bike fits me, perfectly. = 50 mods. I might of missed a couple. So, 50 mods (at least) and NOT a 10??? I dunno... scale 1 to 10? Wow, compared with most here I'm a solid 3. Steve J. --I'm curious about the food warmer. Is that a real thing or just a statement about how hot our bikes get? Pictures?? It's a strap protector(think freight strapped to a flatbed trailer). It's a 90* piece of plastic with slots in it for a strap. I riveted it to the inside bottom of left side fairing. It keeps stuff from sliding out as it heats. It works quite well. No suspension, brake mods, stock wheels, stock engine except for torque cams. WOW, I had forgotten about those. There are about a half dozen sets of those out there so you are in an exclusive club. He-He. Wifey loves 'em and the swing out deal is cool. This bike has your arm rests and a SiSF handlebar adapter, which I believe only three were made. Swampcat? I think I hear the banjos warming up for a story. Chuck has to be a 10 because he's got his all turbo'd up and such. Page created in 0.697 seconds with 26 queries.